By the time we leave Ohio, I'm not going to be able to fit into any of my clothes, including my stretchy yoga lounge pants. 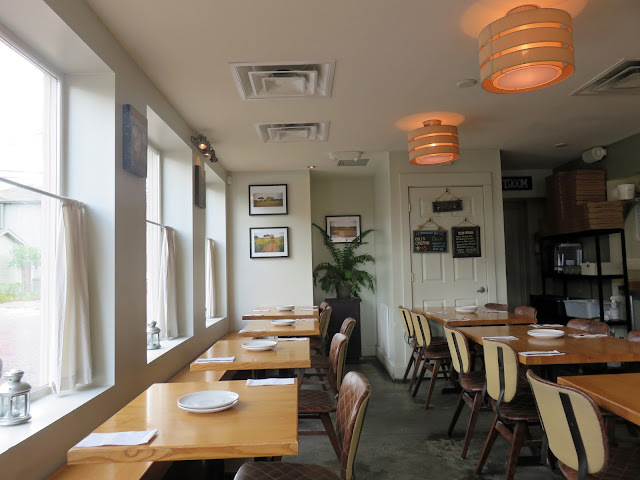 Yesterday we discovered Harvest Pizzeria in the German Village. 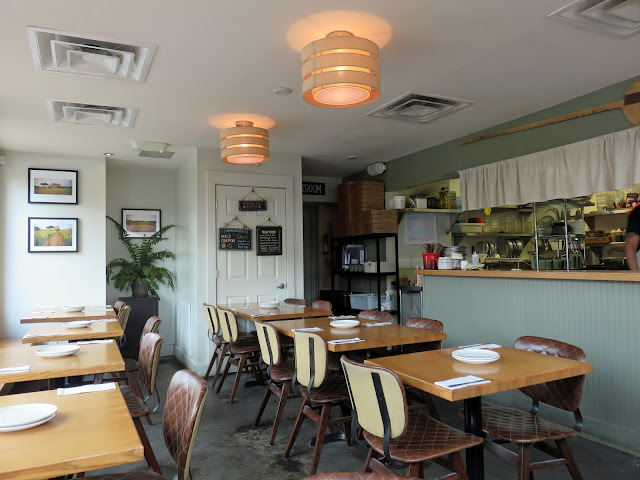 It's a cute little place - tiny inside dining room with an open kitchen, abundant seating on the patio - simply decorated, with an organic feel to it. Our waitress was modern hippie, decked out in Harem pants, Converse sneakers, faded vintage tee-shirt, and a nose ring. Even she looked organic - beautiful, creamy, flawless skin, long hair hanging in loose waves, crisp blue eyes, and long lashes that fluttered against her makeup-free cheeks. We ordered the Ricotta Gnocchi as an appetizer. 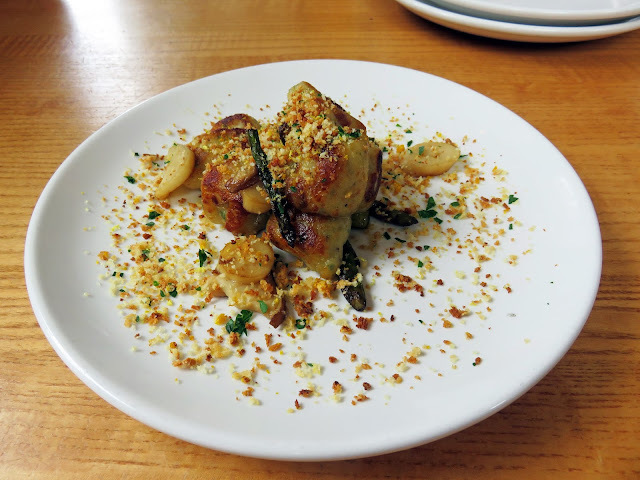 The Ricotta Gnocchi, light in nature, were pan fried and served with French trumpet mushrooms, lemon, chive, asparagus, and Gremolata breadcrumbs. Gremolata is a classic Italian condiment typically made with finely chopped garlic, lemon, and parsley and it's typically used to garnish Osso Buco. But in this dish, tossed with the toasted breadcrumbs, you get the flavor of the lemon zest which adds a bright note and a little crunch to the dish. It was pretty amazing. The pizza menu was pretty extensive and there were so many choices, I was stressing out having to choose just one. We decided, since the lunch special was a 9" pizza for $7.50 - and the waitress, who was a waif, said she could easily eat a 9" pizza by herself - to order 3 different pies so we could try out several flavors. 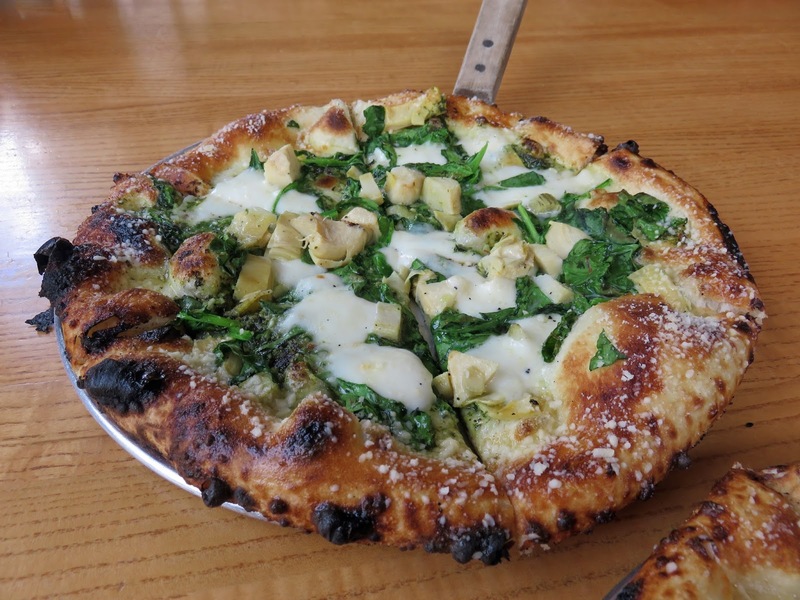 The first was the Almond Pesto Pizza, which had an almond pesto base, spinach, fresh mozzarella, and artichoke. It was delicious. This was my choice. The second pizza, which Ed and I decided on together, was the Pineapple. It had fresh sliced pineapple, mozzarella, provolone, Ohio "Canadian" bacon, and jalapeño. 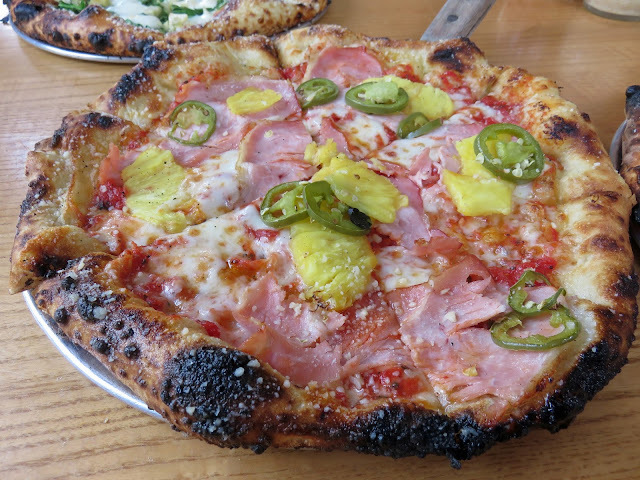 I've had pineapple and ham pizzas before, but never with jalapeño. I'll be ordering it this way from now on because the spicy pepper against the sweet of the pineapple was great. We both liked this one. The third pizza was all about Ed. Called the Spicy Yuma, it had a mix of Gouda and Havarti cheese, Chorizo sausage, jalapeño, corn, and roasted red peppers atop a chipotle-spiked tomato sauce. It was truly amazing. We both loved it. Look at the beautiful crusts on these pies! 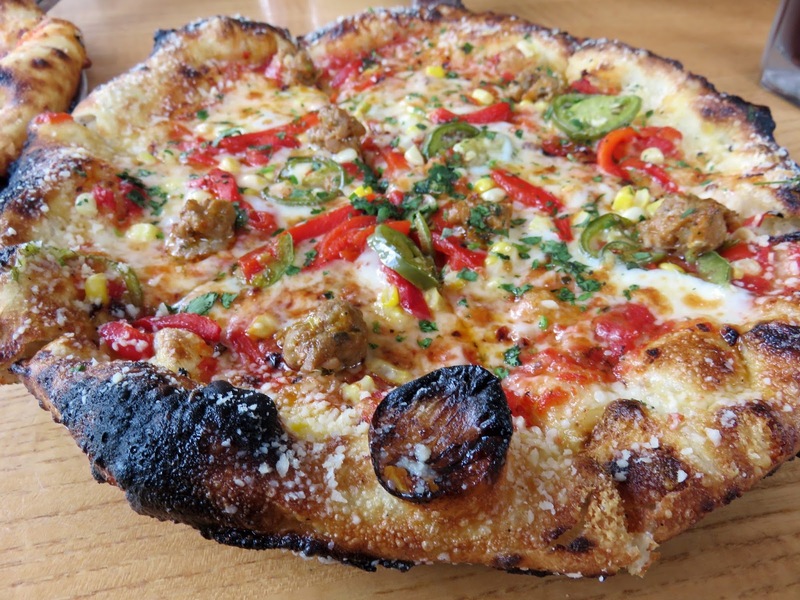 Brick oven cooked, their edges dusted with sea salt flakes, topped with ingredients from local farmers. They're beautiful and delicious. We each ate the equivalent of one pie (the waitress was right, it's easy to eat one yourself) and took the rest back to the hotel room. The next time I dine here, I'm going to have the White Pizza (Black Peppercorn Ricotta, Smoked Gouda, Fresh Basil, Roasted Garlic Cloves, Herbs) and because I LOVE fennel, I must try the Piemonte (Gouda/Havarti Blend, Fra'mani Salumi, Roasted Fennel, and Picholine Olives). And I'm going to make sure to save room for dessert because we skipped the Butterscotch Budino (Caramel Sauce, Creme Fraiche, Toasted Hazelnuts, Vanilla-Scented Maldon Sea Salt) and Affogato (Espresso, Vanilla Gelato, and Chocolate Hazelnut Pirouline) in favor of trying a favorite local ice cream shop called Jeni's. Jeni's Splendid Ice Cream was suggested to us at two other places we dined, so we finally tried it, even though I read on their website that they had a listeria scare earlier this year. We're crazy adventurous like that (and, they took care of it). I had a scoop of their Darkest Chocolate and the Bourbon Salted Pecan, and Ed had the Darkest Chocolate and Root Beer. Let me tell you - the Root Beer was amaaaaazing. I've never seen root beer ice cream. Who knew?? And the other flavor I sampled, which I'd never had was Wildberry Lavender. It tasted like lavender smells. I'm not a fan of the scent of lavender, but this ice cream was actually pretty good. Very unique. We won't be leaving the area for a few days, which means we still have a few restaurants to hit - Marlaina recommended Barcelona - but after that, I'm going to need a week of super-light eating. Not for weight loss, but just to feel normal again. I love eating out but I think I overdid it this week. What a beautiful pizza parlor. At least you will have the sacred cottage cheese, with which to return to normal eating. After looking at your photos of the delicious pizzas, I see why it was so difficult to come to a decision! 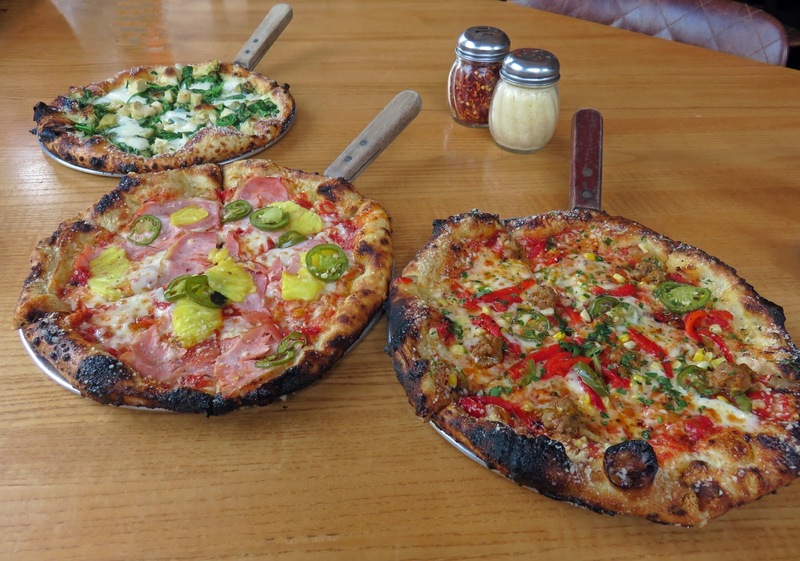 All of these look amazing and the crust looks incredible.